I’ve been in a cooking mood lately and also a having friends over for dinner mood. Yes, those are 2 very distinct moods. For quite a while now, I haven’t been having people over for dinner because I found it stressful – the socializing and all the prep, planning and cooking. So when the two worlds collided, it made everything go very smoothly. It helps to have a recipe that’s an easy go-to for a special meal and I think this kale and ricotta galette fits the bill. 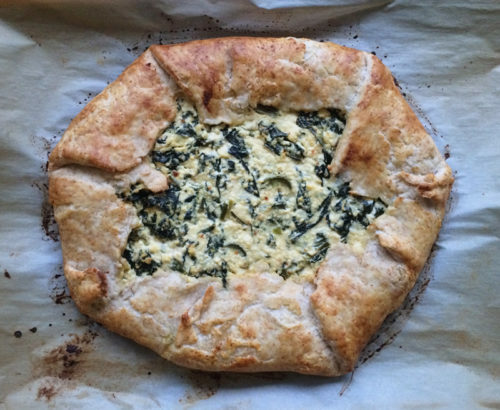 The galette is a great dinner party or casual meal dish because it seems fancier than it really is. 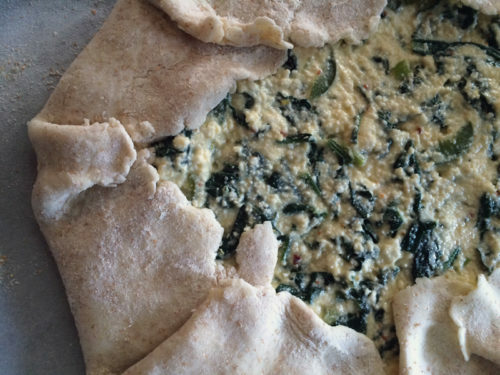 The crust which can set hearts racing comes together easily – just don’t dump all the water into the dough….read the directions carefully a couple times before starting. Planning is key. The pie crust has a bit of whole wheat flour which adds a better texture and gives this dish a more rustic feeling. And the word rustic is key. There’s no fiddly top crusts or worrying about pie dough shrinkage or ripped crusts because everything can be patched up and look amazing. Trust the galette. I made the galette crust earlier in the day and let it sit in the fridge for a bit. I made the filling while the dough chilled and then rolled out the crust. Before popping it into the oven, just brush the crust with milk to give it a nice golden hue. You could use an egg for a shiny finish, but I just didn’t have a leftover egg hanging about. Light and enjoyable for a perfect spring supper. Serve this with a good garlicky green salad or a crunchy fattoush salad like I did (recipe coming soon) and a bottle of red wine and you’ve got the perfect meal to share with family or friends. Before you go make the galette, I’m looking for travel tips for this coming April to the Lake Erie area. More specifically, Pittsburgh, Cleveland and Detroit! There might be time for lunch in Buffalo, NY too. I’ll be visiting family in London, Ontario but we’ll also have a car and plan on checking out rust belt cities that I’ve never explored before. I’ve spent an afternoon in Detroit but I’m hoping to spend a night or two in each of these cities, so I’m looking for help on cool neighbourhoods, great casual places to eat and drink craft beer, hikes, scenic drives and anything interesting. I’m betting on some great Italian and eastern european food (Polish food, bring it!). So far I’ve bookmarked the Jeni’s Ice Cream scoop shop in Chagrin Falls, OH but I’m looking for more ideas. My priorities don’t always revolve around ice cream, just so you know. You’ve always pointed out the best travel tips in the past so I’m hoping for more of the same. I’d love to hear what you’ve got! 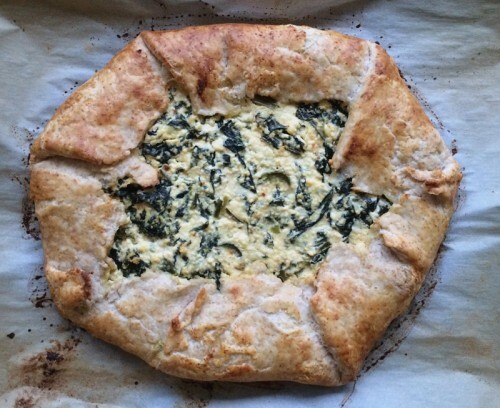 I used kale here, but I can imagine how lovely this pie would be with spring green garlic scapes added alongside the kale. Something to keep in mind when those tasty scapes start hitting the markets. Add the cold water and the ice together and keep in the fridge. In a large bowl, mix together the flours, salt and sugar. Add in the butter cubes and cover with the flour. Use your hands or a pastry knife to break down the butter into pea sized bits – larger bits are okay, just try not to over blend. Sprinkle with the apple cider vinegar and add in a teaspoon of a time of the ice water, using a fork to “fluff” the dough between teaspoons of water. – you’ll most likely only need a few teaspoonfuls of water, so don’t get carried away!!!! When you can pinch the dough, it’s ready. Lay out some plastic wrap and add the dough to the middle and form a disk. The dough should feel only slightly damp. Chill in the fridge for 1 hour or overnight. In a large skillet heat the olive oil and add in the green onions, garlic and the kale. Saute until bright green and slightly wilted. Remove from heat. In a large bowl, whip together the ricotta, feta, egg, lemon zest, salt, herbs, and pepper. Add in the kale mixture and blend well. On a floured surface, place the disc of dough in the centre and flatten it with a rolling pin and then start rolling out the dough into a large circle. Dough should be 1/4″ thick. Place dough into the centre of some parchment paper and transfer to a baking sheet. 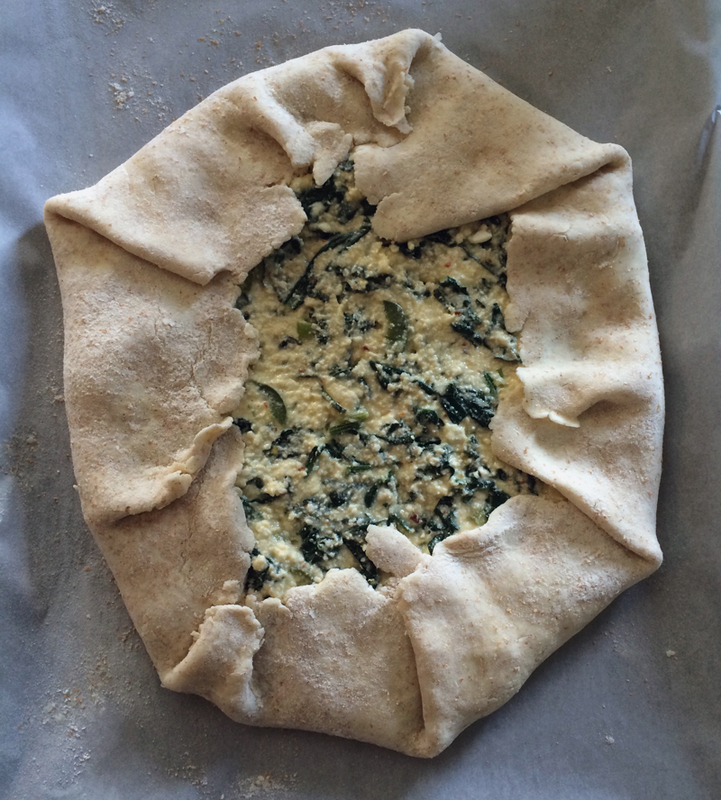 Place the cheese/kale mixture into the centre of the dough, spreading it out but leaving a 2 inch border around the galette. Fold in the galette edges, pleating the dough so you don’t leave any gaps where the filling could escape. Brush the pastry edges with the milk and place in the oven to bake for 35-40 minutes or until the crust is golden. Cool slightly before cutting into wedges. Serves 6. What a fun trip! You probably saw the Detroit post on Lottie and Doof, that had good suggestions. Look at Michael Ruhlman’s blog for Cleveland suggestions. He just wrote about the coolest grocery store that just opened there. Oh man, I would totally hit up Jeni’s! I was so excited the first time I saw a pint in a store. Lydia, I’ve just booked Lottie & Doof’s post – I knew I had seen a post about Detroit recently and I just couldn’t remember from where. Thanks!! Good tip about Ruhlman too. Yay! Joanne, I’ve made that buttermint ice cream and it’s amazing (here’s my take: http://everybodylikessandwiches.com/2012/02/seven-more-years-savannah-buttermint-ice-cream/) & I MIGHT be heading to Toronto….if I do, I’ll keep you posted and we can finally meet up! Now that you mention it, I do remember your buttermint ice cream post. Looks like a great recipe! Wish I could have some now. Yay! Fingers crossed you can make it TO!!! My other Chicago recommendation would be to spend lots of time walking along the lake front … : ) Lakefront Trail is so gorgeous and great. And the art institute in Chicago is huge and the best! I’ll let you know if I think of anything else. Oh no! Just saw that you are not actually coming to the Chicago area. Ha! But I have Buffalo ideas too, so I really hope you get to stop for lunch there! It’s one of my favorite cities ever, so I hope you get to stop in. Detroit Batch Brewing – Brand new! Ooooh, also Hopcat just opened, a tap room with tons of Michigan beer and I’ve heard Peoples Record Store is great. Welcome to Pittsburgh! Wild Card in Lawrenceville sells handmade goods — your cards would be right at home there. It’s right by a new repertory theater, Row House Cinema, and a block or two away from Kickback, which is a pinball-themed coffeeshop with 10 or so machines you can play. Further down Butler Street is a French bakery, La Gourmandine, and just past that is Allegheny Cemetery, my favorite place for a walk. Also in Lawrenceville, the cider at Arsenal Cider House on 39th Street is nice, and I’ve heard they have outdoor seating now. My friend raves about Constellation Coffee nearby on Penn Avenue, but I haven’t been there yet. Abi, I love Chicago and hope to go back on another trip – next time! But thanks for the Buffalo recommendations!! And I’ll most def watch the documentary, thanks! SP, thanks for the Pittsburgh recs! We just booked an airbnb on the north side near the Mattress Factory so I’m pretty excited. I’ve bookmarked a ton of places in Lawrenceville and I’ll have to check out that card store. We’ll be doing a lot of walking and I guess taking transit and I can’t wait. Thanks for all of this! !